Most foreign nationals will no longer be allowed to appeal if they are refused a visa to visit family members, the Home Office has announced. A clause in the Crime and Courts Bill will remove the full right of appeal and instead they will be expected to reapply at their own cost, saving UK taxpayers "tens of millions of pounds". The law is set to be in force by 2014. Interim measures from July will ban appeals for those visiting cousins, aunts, uncles, nieces or nephews. According to the Home Office, the number of appeals from those wanting to visit family living in the UK has risen to almost 50,000 a year, with failed applicants accounting for nearly 40% of all immigration appeals. This, the department says, is "burdening the system and diverting resources which could otherwise be used to settle asylum claims and foreign criminals' deportation cases". In future, applicants will need to re-apply for a visa - which start from a cost of £78 for a short-term visit - if they are turned down. Appeals will still be permitted on the grounds of human rights or race discrimination. The department expects the new system to be faster. Ninety-five per cent of decisions on fresh applications are taken within 15 days, whereas the appeals process can last up to eight months. 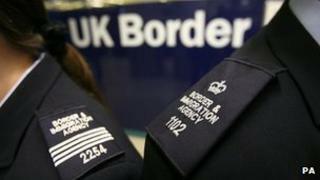 Immigration Minister Damian Green said: "We are not stopping anybody visiting family in the UK. If an applicant meets the rules they will be granted a visa. "However, it is grossly unfair that UK taxpayers have had to foot the huge bill for foreign nationals who, in many cases, have simply failed to provide the correct evidence to support their application." Labour's Commons Home Affairs Commitee chairman Keith Vaz has criticised the change, arguing it will stop relatives coming to the UK to attend family occasions. "It is a system that works and it gives people the opportunity of challenging decisions," he said. But Mr Green told MPs the current system of appeals was "an absolute goldmine for immigration lawyers". "It is not something that is written in the Magna Carta. No other country does it. We don't allow it for other types of visa. It is an anomaly in the system and it is an anomaly which is hugely expensive for the taxpayer," he added. The Crime and Courts Bill must pass through Parliament and receive Royal Assent before becoming law. In the meantime, the government will bring forward interim measures which will apply from July. Subject to approval by Parliament, these will limit the full right of appeal to those applying to visit a close family member only. The full right of appeal has already been removed from other visas, such as the business and tourist visa.